This could’ve been a trap game for Harvard — Bryant is one of the top teams in the NEC, and it boasted the nation’s top scorer through three games in guard Dyami Starks — but the hosts made things look easy, leading by at least seven points for the entire second half and scoring 86 points on 67 possessions. It’s good practice for the Crimson; its nonconference schedule isn’t loaded with premier opponents, but there are more of these tricky games against regional foes — BU, Northeastern, Vermont, Fordham — in which Harvard will, perhaps unfairly, be expected to win easily. 1. More like Steve Monster-Missi, right? Steve Moundou-Missi’s final line: 23 points (10-15 FGA), nine rebounds (four offensive), four blocks, one steal. He was a terror around the basket at both ends, scoring 18 of his 23 points at the rim and skying high in the air for all four blocks. The junior has always been an excellent rebounder and defender, and his offensive numbers are up this year — including from the free throw line, where he’s 11-for-12 — but the most important stat for Moundou-Missi this year will be minutes played. 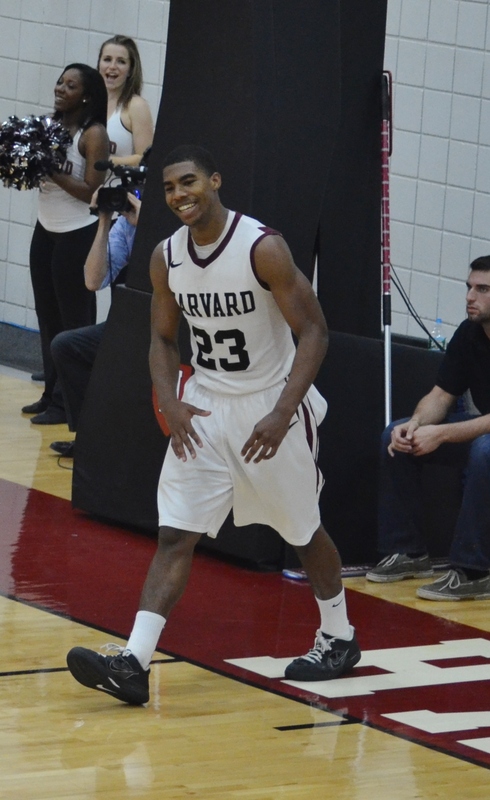 Even in a great game Wednesday, he committed four fouls, a chronic problem for all members of Harvard’s frontcourt. 2. Saunders > Starks. Dyami Starks scored at least 30 points in each of Bryant’s first three games — including 35 at Gonzaga, lest you think he was beating up on pasties — and entered Lavietes Pavilion as the nation’s leading scorer at 33.3 ppg. But he’ll wake up tomorrow morning in seventh place, having scored only 11 points on 3-for-10 shooting Wednesday. Several Crimson defenders paid attention to Starks, but his primary defender throughout the game was Wesley Saunders, who constantly denied the star Bulldog space and swiped the ball from him twice. Saunders never dominated the ball on offense, but he finished with a stellar line: 25 points (on just 13 shooting possessions), five assists, four rebounds, three steals, two blocks. 3. Harvard gets its first road win — at home. 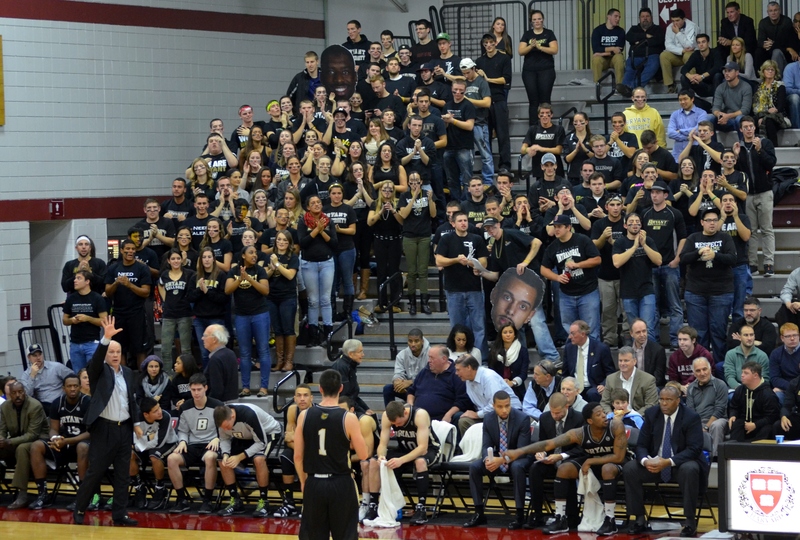 Okay, that’s a bit of an exaggeration, but Bryant students outnumbered Harvard students about 3-to-1 at the start of the game, and the visiting fans were louder for most of the night. After playing zero road games and zero opponents that finished last season in the KenPom top 150 so far (I guess Harvard really does want to be like the big-time basketball programs? ), the Crimson now begins the fun portion of its schedule: At Colorado on Sunday, then the Great Alaska Shootout over Thanksgiving weekend (vs. Denver, then possibly Green Bay and Indiana State). If Harvard stays perfect, it will likely return from the holiday as a Top 25 team — but that’s a tall order, especially if Brandyn Curry remains inactive. 4. Bonus fun stat: First-half score: Harvard 43, Bryant 34. 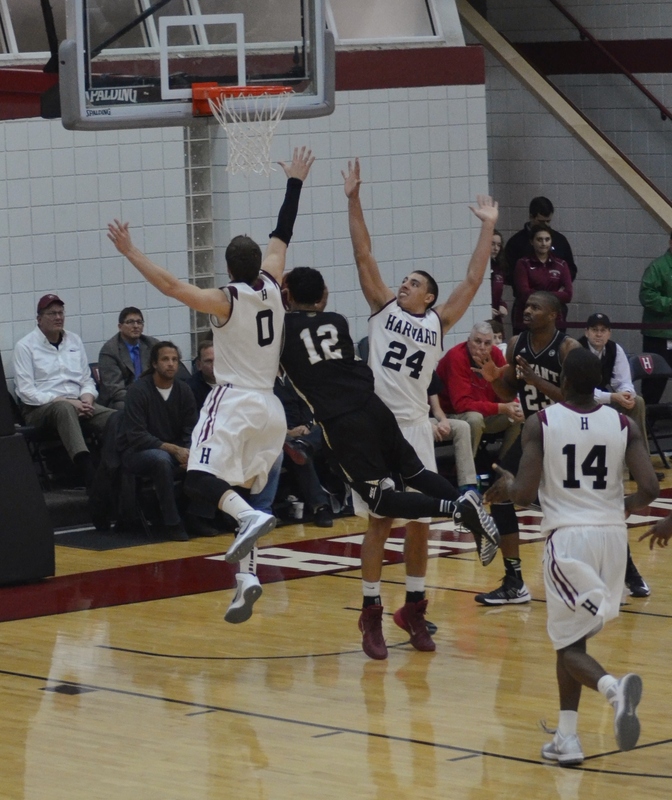 Second-half score: Harvard 43, Bryant 34. This entry was posted in Harvard, Three Pointer and tagged Bryant, Bryant basketball, Dyami Starks, Harvard, Harvard basketball, Steve Moundou-Missi, Three Pointer, Wesley Saunders. Bookmark the permalink.